Pencil on paper, 302 x 192 mm. 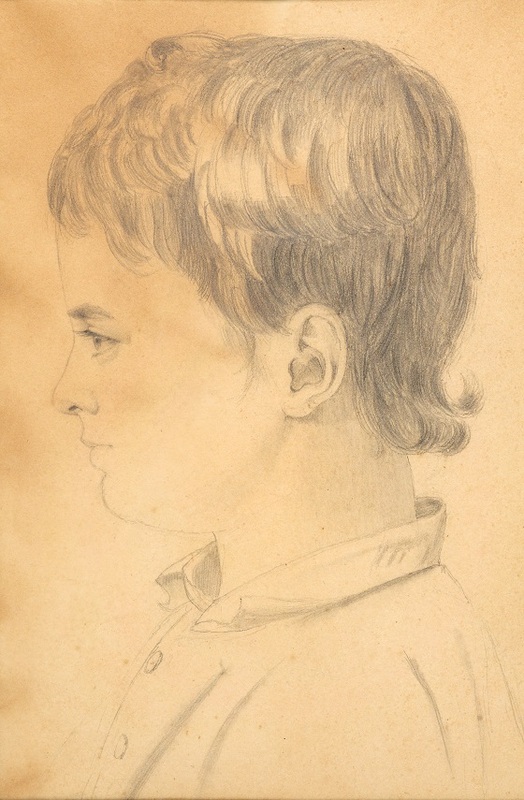 This fine drawing by Johannes Hage’s step-sister Johanne Vilhelmine (called Hanne), depicts a child’s face in profile. Using only a few pencil strokes, she has nevertheless managed to reproduce the boy’s dreamy gaze and mood. In contrast to the simple lines that outline the face, the hair and its varying sheen has been depicted in far more detail. This uncanny ability to capture the personality of her models with just a few effective techniques is a trait Hanne Bissen shared with her husband, the sculptor Vilhelm Bissen. Even though she was not an artist by trade, the child’s portrait shows that she clearly had some artistic talent. It is not known whether the drawing is a depiction of Johannes Hage as a child or his step-brother Alfred, who was a year younger than him.